Discovered a cool new gadget this weekend - a digital photo Christmas ornament, which was advertised in a Brookstone catalog. The digital photo Christmas ornament stores over 50 pictures via its 8MB memory and it'll even play them in a slide show mode. The 3.5" tall ornament has a 1 ½" (diagonal), bright, color LCD screen. Features include photo rotate and crop and auto power off. Now if this thing had video and sound that'd be really cool. Only needs 2 AAA batteries to run and can auto power off. Comes in red or green as seen by these two photos below. Click here for the Brookstone page for this product. The Brookstone photo ornament is now unavailable online. Well, if you prefer to do all your holiday Christmas gift shopping at Amazon, you can buy the digital photo ornaments on Amazon here. They currently are selling them for $49.95$13.97. 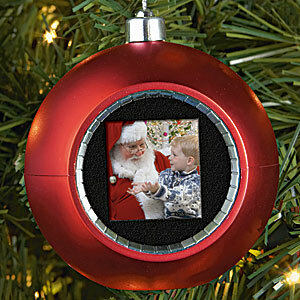 You can also see a collection of various photo ornaments on this Amazon web page. Yeah, yeah, I know this is my 2nd Christmas-related gadget post today. So shoot me for being in the Christmas spirit. Need more Terabytes this Christmas? The 3.5\" tall ornament has a 1 ½\" (diagonal), bright, color LCD screen. Features include photo rotate and crop and auto power off. Now if this thing had video and sound that'd be really cool. Only needs 2 AAA batteries to run and can auto power off. Comes in red or green as seen by these two photos below. Click here for the Brookstone page for this product. The Brookstone photo ornament is now unavailable online. Well, if you prefer to do all your holiday Christmas gift shopping at Amazon, you can buy the digital photo ornaments on Amazon here. They currently are selling them for \$49.95\$13.97.